LE 2-22 is a geometric, glass-clad office building located at the center of the St. Laurent Blvd. 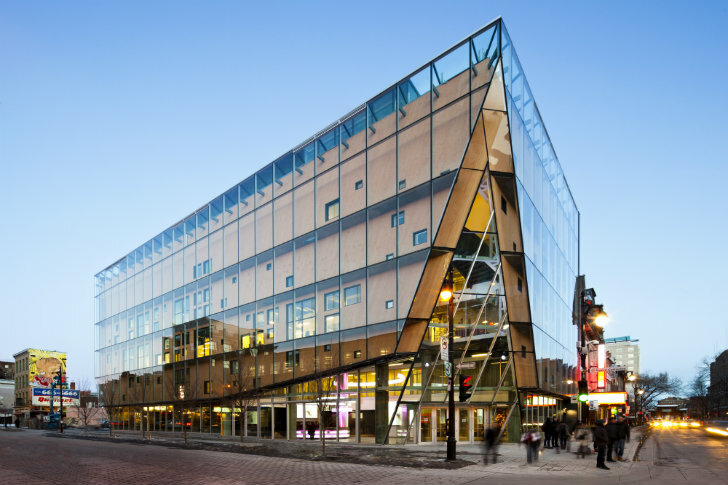 revitalization project in Montreal, which now serves as a striking landmark for the Quartier des Spectacles. Designed by Ædifica and Gilles Huot Architectes, the six-story office building provides space for cultural organizations and was designed to LEED-NC standards. 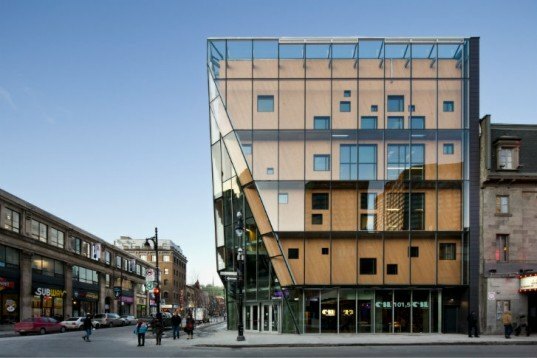 The building envelope creates a beautiful and modern aesthetic with its double-walled skin, which is made with wood on its interior and glass on the exterior. With a restaurant on the ground floor and a bar on the fifth, the office building successfully weaves itself into the urban fabric with a modern offer. LE 2-22 was inaugurated at the beginning of February and serves as the new flagship building to the Quartier des Spectacles. Located at the intersection of St. Catherine St. and St. Laurent Blvd, the office building sits in an important spot and sees significant traffic both for work and special events. As such, the building’s form was influenced by pedestrian traffic flows and features a cut out at the entrance to allow more room for people to move about. Inside the six-story building features a ground floor French restaurant, Le St. Cyr, offices and soon a bar on the fifth floor. The atrium on the ground floor provides space for exhibitions and is also used for radio broadcasts. The Angus Development Corporation ensured its dedication to culture by allocating 75% of the space to cultural organizations like CIBL community radio, La Vitrine, Artexte, Vox and the Regroupement des centres d’artistes autogérés du Québec. Designed to meet LEED-NC standards the office building features a high level of energy performance. Most notably is the envelope, which features a double wall of wood and glass, which works to minimize heat gain while still providing daylight. In the summer a portion of the facade retracts on the ground floor opening up to the street and encouraging natural ventilation. The double skinned facade will also be used for a variety of multimedia installations. LE 2-22 was inaugurated at the beginning of February and serves as the new flagship building to the Quartier des Spectacles. Located at the intersection of St. Catherine St. and St. Laurent Blvd, the office building sits in an important spot and sees significant traffic both for work and special events. As such, the building's form was influenced by pedestrian traffic flows and features a cut out at the entrance to allow more room for people to move about. Inside the six-story building features a ground floor French restaurant, Le St. Cyr, offices and soon a bar on the fifth floor. The atrium on the ground floor provides space for exhibitions and is also used for radio broadcasts. The Angus Development Corporation ensured its dedication to culture by allocating 75% of the space to cultural organizations like CIBL community radio, La Vitrine, Artexte, Vox and the Regroupement des centres d’artistes autogérés du Québec. Designed to meet LEED-NC standards the office building features a high level of energy performance. Most notably is the envelope, which features a double wall of wood and glass, which works to minimize heat gain while still providing daylight. In the summer a portion of the facade retracts on the ground floor opening up to the street and encouraging natural ventilation. The double skinned facade will also be used for a variety of multimedia installations.